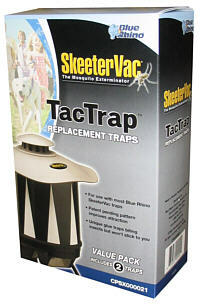 SkeeterVac®'s exclusive TacTrap™ replacement sticky paper is designed for use with all models of the SkeeterVac®, except model SV-1000. Replace when paper is 80 to 90% covered with mosquitoes or other biting insects. The contrasting colors attract mosquitoes. Two Tac Traps™ per box.